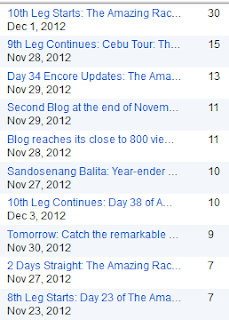 Picture shown above is the Top 10 Most Viewed Blog Posts only for today, December 4, 2012 as of 5:04pm. Please continue to view my blog. 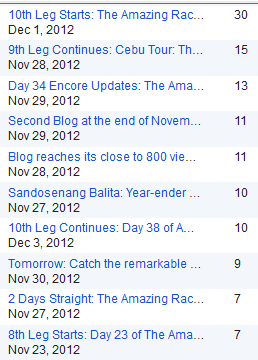 Later, I'll be posting the Top 10 Overall Most Viewed Blog Posts starting from November 1, 2012 until today. Because, by December 31, 2012, I'll be posting the links of the Top 10 Blog Posts for this year. 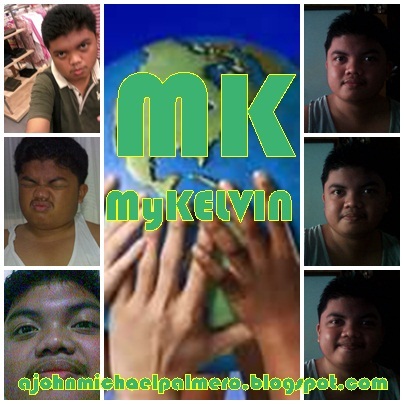 With your appreciated support, I'll be personally thanking everyone who are viewing my blog. To the Twitter followers, to my Facebook friends and subscribers and to the bloggers who appreciates my effort in posting especially to the fans of The Amazing Race Philippines. Again, THANK YOU!